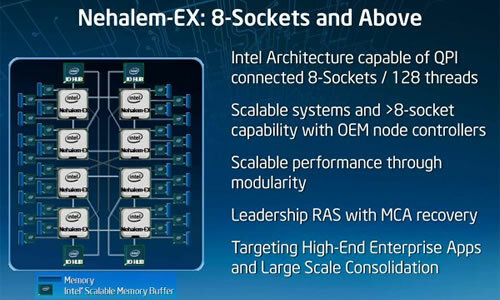 Intel has previewed a new Xeon processor designed for high-end servers, codenamed “Nehalem EX,” that will reportedly feature 8 cores inside a single chip and, thanks to Hyper-Threading, is capable of supporting as many as 16 program threads at the same time. In a briefing today, the company announced that it is on track to enter production of the chip by the end of the year, and expects to be shipping them by early 2010. In the words of Jeremy Clarkson. "Power!!!" This is the trend for the future - especially for servers. 8, 16 or even more cores will be standard in a few years. However, for home users like us, that will only make sense when we get a completely different operating system that assigns processes to all those cores automatically. And if I understand some of the MS egg heads correctly, that is exactly the direction they are going. Some people think it should be the applications that exploit the multiple cores. But that is the wrong approach. It is the task of the OS to manage the resources.